Filling up of various posts on ex-cadre basis in NAIR, Vadodara. Inter Railway Cultural Competition in Dance - 2017 . Grant of Dearness Allowance to Central Govt,Employees - Revised Rates effective from 01.07.2017 . Cultural Competitions - 2017 . ICF Golden Jubilee Scholarship Corpus Fund . Select List for Engagement of Act Apprentices - 2017 . Cash Awards under SBF to the meritorious children of ICF employees . Filling up the Group -B Gazetted Ex-cadre post of OST/TP/Railway Board in payband -2 Rs.9300-34800/- + 4800GP. Selection to the Ex-Cadre post of Liaison Inspector/Delhi. Filling up of the vacancies of Technician Gr.3 welder in Level 2 of 7th PC in the Mechanical Department under 50% Promotional Quota. Selection for the post of Ch.Vig.Inspr in L-7 (4600 GP) on deputation basis to SR, SER, SECR& ECR. Details of participants of Badminton Tournament 2017. Selection for the post of CVI(Mech)/Ex-cadre in Vigilance Department of ECoR/Bhubaneswar on deputation basis. Health & Safety Managers for Training on Emergency Response Care,First AID & CPR. SELECTION FOR THE POST OF INSTRUCTORS FOR STC. Filling up the post of ATCO-I, Rly.Bd in pay band 2 Rs.9300-34800+4800GP on transfer on deputation basis. Filling up of ex-cadre Gazt Jr.Scale/Gr.B posts of Asst Accounts Officer in Rly.Board. Revision of pension of pre-2016/family pensioners-regarding . Option for CMLR workshop/Jhansi/NCR last date extended, submit application on or before 14/07/2017. Selection for the post of Inspector Gr.I/Excadre/Mechanical. Nomination of Secy for AOC/FUR. Nomination of Treasurer for South Colony Committee. ICF Cultural Association - Cultural Programme. Filling up of the vacancies of Senior Clerk in Stores Department through promotion quota. Selection of Watcher/RPF/RPSF in Vigilance Dept,RB. Re-examination of Paper-I on 03.07.2017 for AMM(LDCE)selection postponed. Written Test Result for the post of Jr.Progressman/Ex-Cadre/Mech. Option to fill up posts of CVI with CORE, Allahabad. Deputation of Staff for the post of Assistant Manager/ADMIN to DFCCIL at New Delhi. Written Examination for the post of JPM/Mech/Ex-cadre to be held on 22/06/2017 at TTC at 10.00hrs. Extension of last date reg. Selection for the post of CVI/Accounts in ECR/HAJIPUR. Open-house meeting for improving productivity of ICF. Option on deputation basis for the post of CVI/Medical with North Central Railway. Revision of pension for pre-2016 pensioners/family pensioners etc. Online updation of date of acknowledgement of quarters-Circular. Filling up of post of Senior Inspector(Technical) in the Commission of Railway Safety, Ministry of Civil Aviation. Formation of Safety Committee for Shell and Furnishing Factories. Deputation to staff to RITES/Western Region for the post of Inspecting Engineer in Mechl.& elec.Disciplines. Awareness Programme for Competitive Exams. Constitution of Schools Management Committee. Enhancement of Rent - Tholkappiar and Kambar Marriage Hall. Selection for the post of CVI/Accts in L-8 (4800GP) - West Central Railway. Selection for the post of CVI/S&T in L-7 (4600GP) - Eastern Railway. Selection for the post of AEE(Gr.B) in L-8 of 7CPC Scales through LDCE selection. CIRCULAR - Self Certification for PRAN under NPS -FATCA/CRS Declaration Form . Conduct of GDCE-2017 for the post of Asst.Loco Pilot-reg . ICF Women Employees Holiday Camp to GOA - 2017. Notice - A Circular from General Manager / ICF. Streamlining of vehicles parking facilities in Admin/Office/Fur. Selection for the post of AEN(Gr-B) in L8 of 7 CPC through LDCE selection - List of Eligible candidates.-reg. Distribution of Promotion Office Orders. Filling up of post of SSE TMM in RDSO. Filling up the post of Assistant Library and Information Officer/NRM,NewDelhi in payband 2 Rs.9300-34800+4600 GP. Computer Training Class at ICF Institute. Filling up of Ex-cadre(Gr.B) post of Asst.Traffic Manager(Emergency control)/Rly.Bd in payband 2 .Rs.9300-34800+4800GP on deputation basis. 62nd Railway Week Celebrations, 2017 - Competition Result. Implementation of Supreme Court Judgement date 31/10/2013 in WP(C)82/2011-Constitution of Placement Committee for Postings/Transfers in all Group-C categories of all department except Accounts and Security. By-election to RK Nagar Constituency of TN Assembly. SMS Based Information Monitoring System- New Numbers. Presentation of Trophies/Shields/Cups - RWC 2017. Enhancement of Rent - Thiruvalluvar Marriage Hall (ICF DJ Community Hall). Circular -GDCE for filling up 25% DR Quota vacancies in the category of Asst. Loco Pilot. Launching of Additional online facility to ICF Employees - Submission of application to PB online. Trade Allotment for the employees selected for the post of Technician Gr.III in Level-2 against QSE quota (25%). Application for the post of Vig.Inspector - Level - 6 at Bilaspur/SECR. Grant of Advance - 7CPC recommendations - Amendment to rules on Computer Advances to Railway servants. Prohibition of Activities affecting cleanliness and Hygiene in Railway Premises. Submission of Form 10E u/s 89 of IT Act,1961. Ban on use of loudspeakers/public address systems in colonies. Selection for Ex-cadre in Advanced Welding Training Institute (AWTI) . Selection to the post of Junior Engg/Works in Level-6 of 7 CPC (in pay band Rs.9300-34800 + 4200 GP of VI PC) against PQ in Civil Engg. Dept. Selection to the post of AMM(Gr.-B) in Level8 of 7CPC scales (Pre-revised Scale of PB-2; Rs.9300-34800+4800 GP) through Dept.Selection (70%-PQ). Selection to the post of AEE(Gr.-B) in Level8 of 7CPC scales (Pre-revised Scale of PB-2; Rs.9300-34800+4800 GP) through Dept.Selection (70%-PQ). 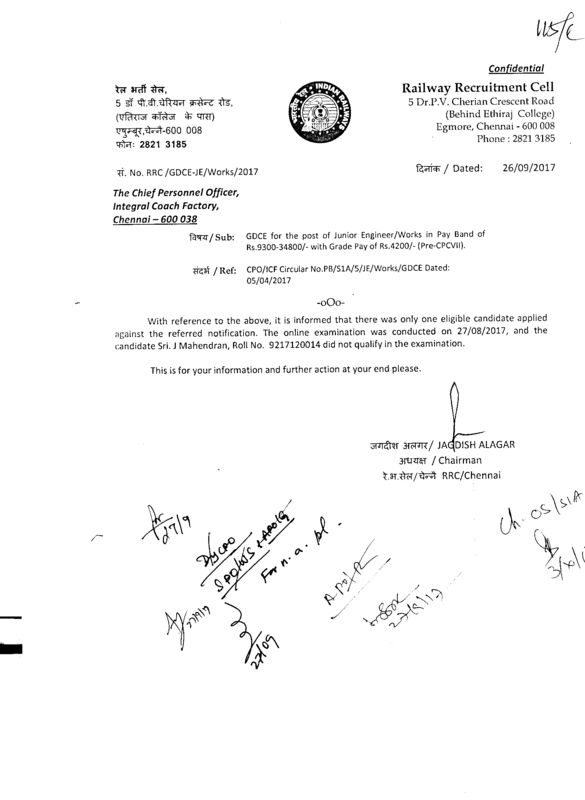 Selection to the post of AME(Gr.-B) in Mechl.Dept. through LDCE Selection (30% Quota) in Level-8 of VII CPC (Pay band-2; Rs.9300-34800+4800 GP). Constitution of School Managament Committee. Nomination of President for ICF Institute Managing Committee. Deputation of Staff to RITES/Northern Region, SCOPE, Minar,Delhi & CAMTECH/Gwalior -Formation of Panel for Inspecting Engineers,SSE & JE(Mechl)- inviting applications therefor. .
1) Inspecting Engineers - SCOPE Minar,Delhi. . 2) Group-C posts - CAMTECH/Gwalior. . The Lokpal and Lokayuktas Act,2013 - Submission of declarations and assets and liabilities by Rly.Servants -regarding. Induction of CVI/A in payband-2 9300-34800 +GP 4800 + Rs.2500 as Spl.Pay under GM/Vig,E.Rly/KKK against ex-cadre post as applicable from time to time. Selection for ONE post of Chief Vigilance Inspector (Engg.) Rs.9300-34800+4600GP in Vigilance Department/Central Rly. GDCE examination for filling up of post of Commercial Clerk,Ticket Examiner in PB Rs.5200-20200+2000 GP and Clerkcum typist in PB Rs.5200-20200+1900 GP. Consolidated Rules governing the ICF Colony Committee in respect of all the colonies. Extension of Date upto 06.01.2017 regarding selection for post of Chief Vigilance Inspector/S&T in Pay matrix Level-7 (4600 GP 6thPC) in Vigilance Dept. of E.C Rly./Hajipur. Addendum to PROCEDURE ORDER No.01/2016 dated 13/10/2016. Issue of Provisional Common Seniority List in respect of erstwhile Group-D (Peon, Mali, Vendor, Sanitary, Trackman and Assistant Cook categories) in Level-1 of the 7th CPC Pay Matrix. Selection for the post of Jr.Engg/Elec in pay band Rs.9300-34800+4200 GP(Level-6 of 7CPC) against Promotional Quota. Suitability test for selection for the post of Sr.Clerk through Personnel Seniority Unit. Result of Trade Test - Tech.Gr.III/Elec.